There's nothing better than emotion at a wedding. For this Indian wedding, which took place at the Laguna Cliffs Marriott in Laguna Beach, California, my Gujarati bride let her emotions show throughout the day. But it was during the vidaai (or vidai) that everyone's emotions showed without restraint. A vidaai is when an Indian bride leaves her family and joins another. In the past, a bride might never see her family again, or she might not see them for a very long time. Today, Indian brides often end up living very close to their parents, so the symbolism behind leaving their family is what prompts the tears. For most vidaais, relatives line up and wait their turn to bid farewell to the bride, and to ask the groom to take care of her. Many relatives cry, but it is the mommies and daddies who cry the most. I love photographs of the mothers, fathers and brides crying. 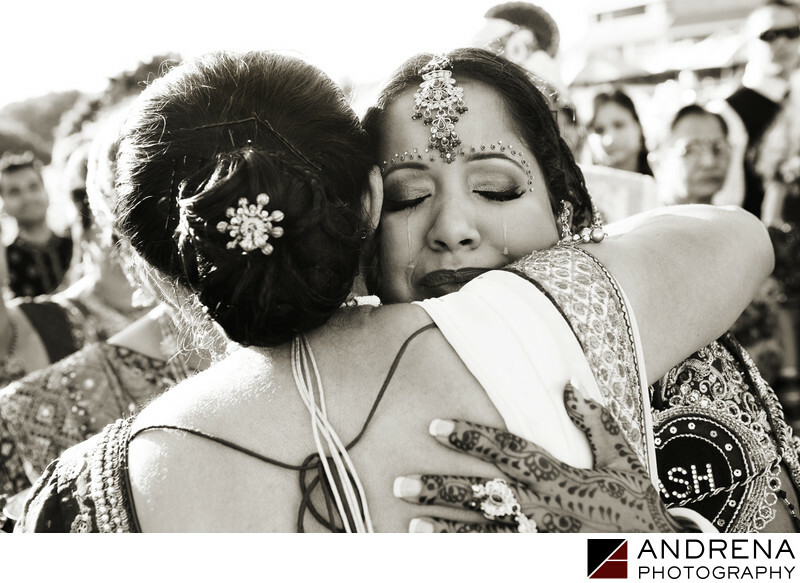 In this photograph, which focuses on the bride's tears as she hugs her mother goodbye, you can see an auntie looking on in the background, which adds a sense of place, and another element of sorrow. The use of black and white processing helps focus in on the emotional nature of the image itself. Indian wedding photographed at the Laguna Cliffs Marriott in Laguna Beach, California.